Are you looking for some quick tips for back to school? I've got just about 2 weeks to go before we start, so this is definitely where my head is right now. And I'm starting with getting my room set up. And that all starts with a theme. Apart from trying to have cohesive colors in my room, I wouldn't say I have a decorating "theme" for my classroom. I do love having a nicely set up classroom, and I do love the cute classroom themes I see all over pinterest and facebook, but a full out theme is not something I thought I could pull off - decorating-wise or time-wise. But ... does a classroom theme need to be a decorating style? Does it need to be time consuming and costly? In one little word, NO. My quick tip is one that worked very well for my class last year. Classroom themes can be easy. Classroom themes can be one simple but powerful word. I wanted our theme to be more than a decorating style. I wanted it to mean something. 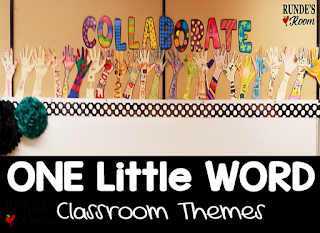 So instead, I took my "theme" from the one little word I thought was most important for us to have a successful year, and such an important life skill for the future - my classroom theme was (and will be again this year) "collaborate". 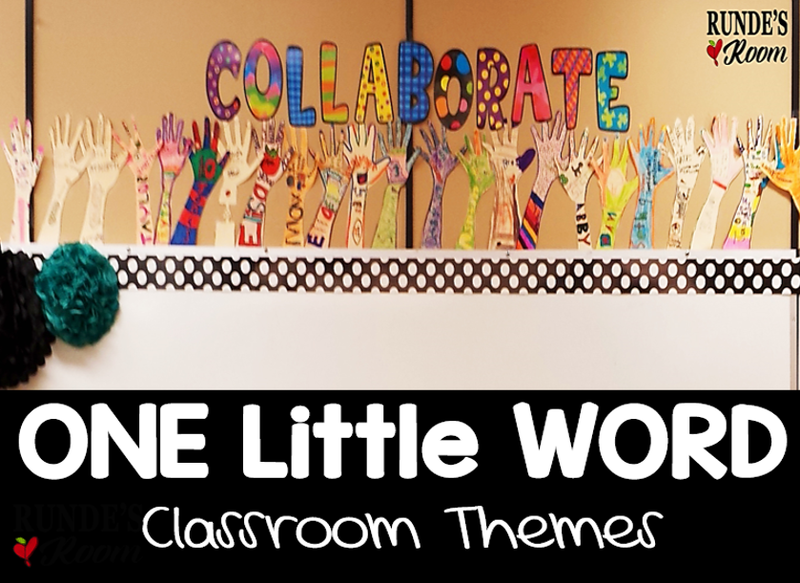 "One Little Word" classroom themes can be taken from anywhere. They can be from a novel you are starting with (if reading Wonder at the beginning of the year, "Choose Kind" would be a fabulous classroom theme), they can be a character trait you want your students to display, or a verb meant to motivate like Think, Encourage, Lead, Persevere, etc., or a growth mindset word or phrase you want to keep reminding your students of. It just has to be something you remind your students of daily, and keep reflecting on throughout the year. 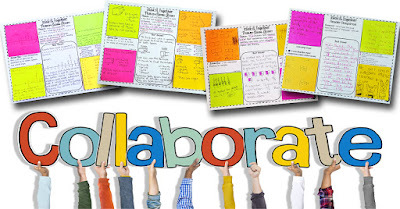 For me, collaborate is what I wanted my students to start right from day one. It was something I knew was necessary for all of us to have a successful year. So, we got started right away. I had each student trace their hand and arm, and decorate the inside with the names, and other words and pictures that were important to them. Then, we posted our hands reaching up to our goal - and used my big bulletin board letters to spell out COLLABORATE. This was placed over our main board, so it was in front of us every day, all year long. A great reminder throughout the year as I knew I'd be having them working together and learning from each other every single day. As soon as that was done, we talked about what the word means, and how we collaborate in the classroom - not just student to student, but student to teacher as well. 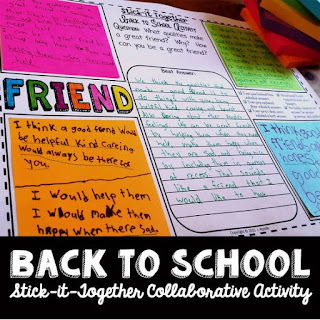 After a great brainstorm session, we tried it out with our first Stick-It-Together Collaborate Activity - one for back to school. It was a great way to start to get to know one each other, start thinking about what our year was going to be like, start working on our goals, and most of all, start to COLLABORATE. I can't wait to share pics from my classroom set-up this year - full of reminders to collaborate, space to collaborate in, and resources to collaborate with. The two-week countdown is on! Check out some more ideas below from some of my fabulous blogging friends, and get ready to grab some inspiration to make this the Best.Year.Ever! I start with each student introducing themselves to the class. I usually hand out an "all about me" questionnaire. I try to have questions that will engage students, like what is their favorite TV show and least favorite food. When it's time for students to introduce themselves, they say their name and share their answers to any two of the questions they'd like. This usually gets the kids talking and sharing and connecting. I then collect the questionnaire and use the info to get to know my kiddos better. I love telling the students all about me on the first day. I think it is really important students see us as people not just their teacher. Brand new fifth grade teacher here, so had no idea what fifth graders would want to do...we did a teacher quiz (free on tpt) where each person wrote his answer and then the group chose one for their final answer. Good fun. I give my children magic playdough to use . They always love it! My school is small enough that all of my students know each other because they've been in the same class for years, sometimes since pre-K! Since the kiddos know each other pretty well, we did a "Find someone who" by mixing up the two classes. I love to play 2 truths and a lie. Even kids that know each other well in a small school like I'm at can think of something new to share! I love to take a picture of each student with a "first day of school" sign, then we do it again on the last day! I love collaborative activities, like spaghetti towers or cup stacking challenges. I also give each student an index card at the beginning of Day 1 so they can write down any questions they haveNd I read through and answer them whenever we have a few moments. Your Stick-It-Together Sheets were a game changer for my kiddos. I've used the concept now in all sorts of contents and I've seen each student improve in general, but then I'm so impressed with that they can come up with together. It's seriously one of my favorite ways for students to respond to a question now. One of my main focuses at the beginning of the year is celebrating each other and our differences and how we can come together as a one school family. That's why I love to do the "Best Part of Me" writing activity. It makes a wonderful display and gets students sharing about themselves and appreciating others. This year I did "Saving Fred" (a collaborative STEM activity) and my students absolutely LOVED it!! One of my favorite activities is having students decorate their own puzzle piece that we put together and talk about how "we all fit in" to our class! I love doing the find someone who get up and move activities. I like to do the Buddy Venn diagram idea. Students talk to a partner and write what they have in common in the middle and how they are different in the outside circles. I love doing Math About Me (using math and numbers to learn about each other)! I always make sure to take a class picture and individual pictures sometime throughout the first week, so we have them to look back on later. I also provide my students with some sort of "About Me" poster to color for morning work the first day so they have something easy to keep them busy while I run around like a mad woman. I love doing Saving Fred and Marshmallow Towers-great for working in groups! My favorite writing activity to start the year is your First Day Apple Craftivity. It helps me get to more about my students as well as learn about their writing abilities. Plus it is super cute!!! I like to start with read alouds and team building. "First Day Jitters" and "Saving Fred" are favorites. One of the things that I always find useful is a Google doc to-do list that I add to throughout the year to remind myself next year of things I forgot to do during BTS this year! My favorite activity is the 1st Day Apple Creativity too! Ditto for the reasons stated above by Mrs. Decker. I'm able to observe who has pride in their work and their focus on the task. My favorite activity to build some connections is "Me, too!" Each person takes a turn to tell something about themselves. (I have 1 sister, my favorite food is pizza, etc.) After each person shares, those that also have that in common stand and say "me, too!" I have your Stick It Together product and great text structure stations ready to go! I like to do the 3 person drawing, and find someone who activities. I love collaborative activities that help my students get outside their friend groups and find commonalities between new students! I also think it's really important that the students get to know about me, in order to start fostering a safe and comfortable relationship. My back to school tip is "organization". I struggle with this every year. Putting emails into labeled folders online, using file folder bins or cabinets for "paper" resources, etc. Being organized saves so much time. Saving Fred is always a big hit! My kids love working together. I've been using partner cards for years for students to pair up. The cards have pictures on them and they have to find their match and that's their partner for the activity (ex: peanut butter is a match with jelly) the kids love when I use them! I pass out letters from last year's fifth graders that give advice and a preview of what to expect in fifth grade. Then I partner them off and have them interview each other about their favorite books, food, color, etc. Each student has to then write a paragraph about the person they interviewed and introduce him/her to the rest of the class. I save their paragraphs as writing samples to look back at toward the end of the year to see how much they've improved as writers! Fabulous idea! This year I plan on team building by having students collaborate on various icebreakers that also involve first of the year procedures, rules, etc. I'm saying bye bye to too much teacher talk first week of school! We always have a discussion and then create a chart about kind words versus mean words. After we finish we display the kind words and bury the mean words. Like your share about collaboration. Wonder if I can do something similar with my kinders. I will think on it. I think it's important to start off the school year (and each day if possible) with Morning Meeting and giving students the opportunity to welcome each other to class. I've heard a lot about Saving Fred and I'd like to try that this year. I like to do an all about me art activity and have students share in partners then small groups. I always start the school year with First Day Jitters and Jitter Juice! It has become a tradition! I create a classmate word search for the students to complete as their morning work! I use these one word theme ideas in my Morning Messages. My favorite one is empathy. Each day I expand on the word from the basic meaning to specific examples to parts of speech. Thank you for sharing these back to school tips. They are great! Great idea for a theme that will last all year! I also like the idea of one-work themes that will be featured in a novel you will be reading in class this year. I love your approach to a theme and making it meaningful! Thanks! I did something different this year, the 1st thing I did was to read alod "The Invisible Boy", which led to a great discussion about kindness, acceptance, and bullying. I love the Choose Kind idea! Love this idea! I've sort of used a theme in the past, without realizing it: be kind! One of my favorite back to school activities is the cup stacking activity that you've blogged about previously. Students think of a positive adjective that begins with the same first letter as their name. This is what they write on their name tags. Sometimes I also have them bring a personal artifact in to share with the class. Both of these are from Capturing Kids' Hearts. I like to do "Find Someone Who" activities on the first day. It gets the kids up moving and interacting with one another. It's so important to give students ample opportunity to practice expectations! Working collaboratively and persevering are two qualities that I want my students to use throughout the year, and we work hard to practice those skills in nonacademic ways. This year we Saved Fred and Helped Harry! i also love save fred and the M&M get to know you game. one year i allowed my students to grab as many candies as they wanted without knowing why. they then had to tell us one thing about themselves for each candy. most kids grabbed a few, but there was one kid who had a LOT! it was a riot listening to him find things to say about himself. First Day Jitters activity for sure. We all have them! I love to start the year off with Can You Save Fred! I always start the year with a science experiment. Gobstoppers is a great one! I always start off the first day with a special book and activities that are fun to do with the book. I like my kids to make an art project during our first 3 days so I can decorate the hallway too. This year, I started 6th grade with a stations activity. I thought it worked great. Another beginning of the year activity is My 3 Words. Students work in a group of three and create a 3 word phrase that represents them. Then, I video tape them presenting the phrase however they choose. Finally, I create a short video of all of the My 3 Word clips. We show it at curriculum night as parents are coming in. I start with a read aloud, The Important Book" and then some activities to go along with the book. I use an anchor chart with the question:"How I used my reading skills over the summer." Students are given a sticky note, we discuss how we use reading skills every day by reading road signs, helping mom read grocery ads, etc. They then write at least one way they used their reading skills and stick it to the chart. I have students interview each other and then present about their partners. I like to do a classmate scavenger hunt and start right away with Bucket Fillers. I like to start with a Find Someone Who... or with All My Friends. We tried Saving Fred this year. It was a hit!!! We also did One Word in One Minute. The kids randomly pulled a word from a basket and had to talk about it for one minute. There were crazy words like toes, pickles, grass, etc. This was practice for a similar activity we do with content material. I do a Skittle activity using the colors to tell about themselves. I have students write letters to themselves. What they write is up them, but I encourage them to write about their favourite things and what they hope to accomplish this year. The letters are sealed, I keep them, and then hand them back on the last day in June. I look at the yearbook so I can greet students by name. I read First Day Jitters and we talk about how even teachers get nervous on the first day of school. I complete an All About Me activity and Find Someone Who interactive activity. The Cup Challenge (that I first discovered here on your blog!) is one of the most fun, engaging, and meaningful activities I've done! I love the Cup Challenge. So much fun for the kids and me too!! I have several activities I use on the first day of school. My favorite is Save Fred and a big hit in my classroom last year was your collaboration activities. Get to know your students' names and faces quickly. everyone likes to be called by name. Playing Find Someone Who is always a favorite! I love the idea of one word theme. I think by focusing on one word students will get a better understanding of that word and what it looks like. I love that you also chose the word Collaborate. For my sixth graders it a challenge to for them to really collaborate properly--lots of practice needed. Even though we are well over a month into school, I think I am going to make this my theme. Thanks! !